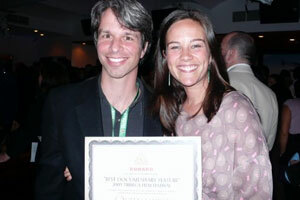 Bristol Baughan | Alumni News | American University Washington, D.C.
Bristol Baughan, SIS/BA ’03, and director Marshall Curry at the 2009 Tribeca Film Festival, where they won the jury prize for Best Documentary. The motion picture just got faster. Racing Dreams, a documentary film produced by Bristol Baughan, SIS/BA ’03, has been acquired by DreamWorks Pictures and the producers of Star Trek and Transformers to be made into a fiction feature film, currently in development with a release date of 2013. Baughan’s doc follows three youngster-racers as they compete in the World Karting Association's National Pavement Series. Burning rubber, these kids pursue the National Championship title so they may have a chance at the ultimate finish line - NASCAR. “I think the film humanizes a part of America that tends to be unfairly judged and conveys universal themes,” she says. Baughan, a freelance film director, producer, and consultant, teamed up with Oscar-nominated director Marshall Curry, and went on to win the jury prize for Best Documentary at the Tribeca Film Festival 2009. Her motivation to make the film came out of a conversation with Curry. “We got to talking about how interesting it is that NASCAR is the 2nd most popular sport in America, and then I heard about the Little League of NASCAR – the World Karting Association,” she says. “It was surprising how engaging the kids were and how extremely good they were at racing. All were complex, interesting characters,” she says. Baughan’s been busy ever since. Her film credits include By the People: The Election of Barack Obama (HBO, 2009) with Edward Norton, Which Way Home (HBO, 2009), Son of Rambow (Paramount Vantage, 2007), and The Power of the Game (National Geographic, 2007). In 2004, Baughan cofounded the startup company Reason Pictures, which later merged with GOOD, a media company “for people who give a damn,” that includes a print magazine, videos, live events, and a Web site. “It’s what I’m most proud of so far,” she says. Out of the many roles Baughan has taken on in her career, such as director, producer, and crew, she enjoys the aspect that ties each responsibility together – storytelling. She’s focusing on directing, which “allows me to find a story with a surprising, fresh angle.” In fact, she’s currently writing a political sci-fi screenplay, which she plans to direct herself. For now, Baughan is still riding high on the success of Racing Dreams, which opens in theatres in New York City on July 9 and Los Angeles on July 23, as well as Morocco in November at the State Dept. Documentary Showcase for a screening for the consulate.